Churches and ChapelsWHERE? There are so many beautiful places! Now that you've determined your Style, Size & Budget and you want to Get Married in Mendocino - look for locations that best fit your criteria. It's important to note: The availability of your favorite Mendocino wedding location might even determine your wedding date. Beautiful locations book-up well in advance! If you have a specific place or date in mind, it's best to reserve your favorite VINEYARD, Historic MENDOCINO CHURCH or Elegant MENDOCINO INN as quickly as possible, to insure you get your favorite location. This full service seaside resort is a fabulous wedding destination. 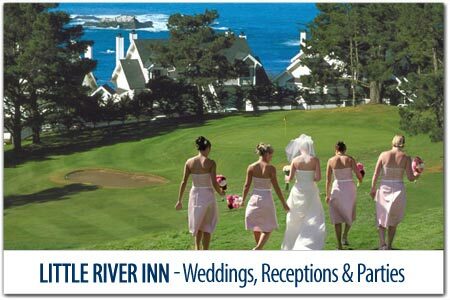 Offering everything from picturesque ocean view weddings and reception halls with in-house catering, rehearsal dinners, day spa for the bride and bridesmaids, and a golf course for the guys, plus plenty of on-site lodging (No Driving) for your guests and romantic honeymoon suites for the happy couple. 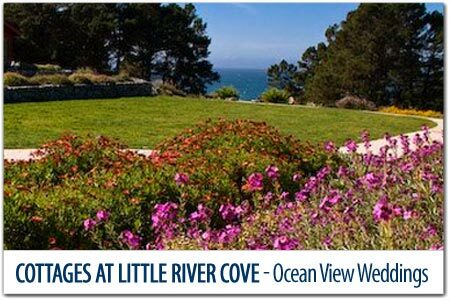 Wedding Cottages at Little River Cove The spectacular ocean views and beautiful gardens create a stunning, intimate atmosphere for your special day, and their attentive staff will ensure your wedding is executed to perfection. They provide comprehensive event coordination and services. ENJOY YOUR WEDDING and RECEPTION at SWITZER FARM. This picturesque Victorian Mansion is located on 22 private oceanfront acres. 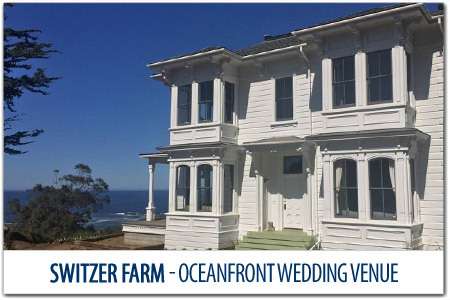 This fully restored Victorian has 7 bedrooms with beautiful ocean views. Perfect for intimate weddings, celebrations and family get-togethers. 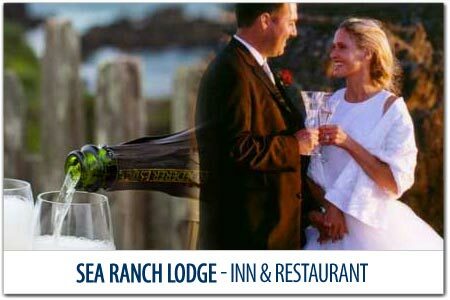 Sea Ranch Lodge features several unique ceremony venues all incredibly and naturally beautiful. Besides a stunning setting, they offer indoor and outdoor wedding facilities, exceptional food, wine, ocean view accommodations, and attentive, friendly event assistance to ensure an unforgettable wedding.